The story goes that a lady who was from Geneva, New York named Geneva, Florida. Emma Van Brunt Wilcox is said to have thought that Harney Cove (what the Geneva area was originally called) looked like her native Geneva, New York. Mal and Mary Jo Martin on one of their camping trips decided to visit Geneva, NY and see what they could find. Geneva, NY is in what is called the Finger Lakes Region of west central NY State and is located on the west shore of Lake Seneca. (The lake is also part of the Erie Canal system.) Geneva, NY is now a much larger city than our Geneva, but it still has a small town feel. As Lorraine Whiting had found in years past when she visited Geneva, NY, the Martins also found evidence that there were Van Brunt and Wilcox families in Geneva, NY in the second half of the 1800’s. An exiting find was the newspaper clipping about the marriage of Emma Van Brunt and her husband, John Wilcox. But the most interesting thing they discovered was when they decided to have a picnic lunch at the lake. Standing on the west shore one would have thought that they were looking at Lake Harney. 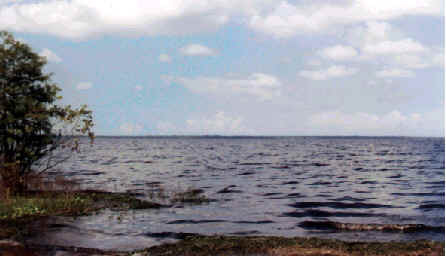 The lake was approximately the same distance across, the shoreline on the other side could have been Volusia County looking across Lake Harney, and the water was nearly the same color. Can you tell which lake is which in the pictures below? 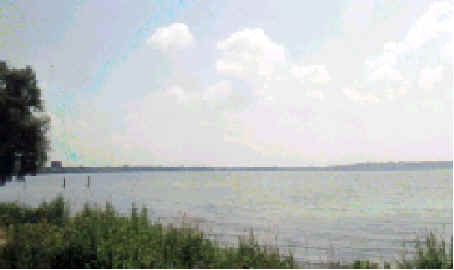 Answer: A. is Lake Seneca in Geneva, NY and B. is Lake Harney in Geneva, FL. One can certainly see why Emma Van Brunt Wilcox thought that our Geneva looked like Geneva, NY. When she lived in NY, the census listed the New York Geneva as a “village”. It is definitely a city now, but we still have our “Village of Geneva”. Your letter addressed to me at Auburn, N.Y. my summer home address, has just been received. When I was a boy I visited my Aunt, Uncle and Cousin at Geneva, staying with them for about seven months in Geneva and at that time recall Mrs. Taylor came to my Aunts very often. My Aunts name was Emma VanBrunt Wilcox, she was my mother’s sister, and their birthplace was Geneva, New York; My Uncle was married previously, my Aunt being his second wife, and they had one child, Hayward Sudam Wilcox; there was one child by his first wife, Ella Wilcox, she never lived in Florida to my knowledge. Originally my Uncle and a friend, Adelbert Shipman, came to Florida attracted to that state by the climate, as Mr. Shipman was ill. At that time the country was very wild, no settlements south of Sanford along the St. Johns River; they built a boat I believe at Sanford and went down the river to Lake Harney and south camping out and hunting and fishing. The climate agreed with Mr. Shipman so they bought a tract of land on Geneva Lake, and my Aunt named the lake and also the town. Mr. Shipman was one of the original Gas engine manufacturers with a plant in Rochester, N.Y. Mrs. Shipman came from Newark, N.Y., her father being a doctor, at that point, as I understand, until he came to Geneva to live; and Hermino born in Geneva and she lives at Jacksonville, Florida, her name is Mrs. John Leu. At that time the Shipman’s only wintered in Geneva. Mrs. Shipmans father, the doctor, Heath, did not go north during the summer. I cannot give you any idea when my Uncle and Aunt died but I think I may have some old letters from my Cousin telling me of his mothers death and possibly in regard to his father’s, these letters are at our Auburn home and when I return this spring I will see if I can give you any further information on that point. We do not expect to leave here until at least the 20th, of May. I am sorry I cannot give you any information that would be of more value; and would be glad to hear from you as you as to just how you make out in your investigation. In the past there have been many different versions of how Geneva was named. Here are the most frequently quoted versions. Version #5: And the wildest version was overheard at our museum open house on the 4th of July, 2001, when a visitor explained to family members that he was showing through the museum, that there was once a family in the area who had 2 daughters named Geneva and Oviedo, and the towns were named after these 2 daughters!